Since the beginning of 2000, there have been three S&P 500 Index bear markets, defined as a decline of about 20% or greater. Would your clients benefit from “just in case” risk management for their portfolios? Iknow it’s true. People have insurance of some kind—health, auto, life, disability, renters, and/or home. 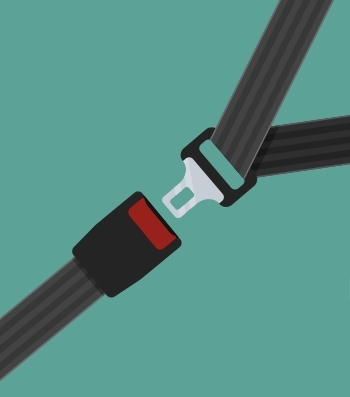 When you drive, your car has seat belts and lots of safety features, like airbags. The roads you drive on have markings, safety engineering, and guard rails on the riskiest stretches. When doing your taxes, you may employ an accountant or use expert-prepared software. When you bought or sold your home, you probably used a real estate agent or at least reviewed Zillow or some such software to get an idea of value. Needed a new furnace or air conditioner? You called an HVAC company to make sure it was done right. In your kitchens, the pantry has canned food, and maybe it’s stocked with bottled water. If there are young children in your house, it’s likely there are covers on the outlets and latches on the cabinets. If a newborn has joined your family, there may be apnea detectors or a room monitor. On the other end of life’s spectrum, if there’s an elderly person in your home, extra precautions in the bathroom, bed rails on the bed, and a necklace with a button to summon help are likely to be evident. I could go on and on with examples of how people seek to protect themselves and their loved ones from the common dangers of everyday life. And whole articles have been written about why each of the examples given is a wise step for us to take. There are at least three elements common to all of the examples: (1) a real danger exists; (2) multiple, redundant protections are usually recommended, usually employing the use of experts or the products of their labors; and (3) the need to act in advance of the appearance of danger is necessary to mitigate the risk. Yet when it comes to investing, investors seem largely unaware of these elements. And the farther investors progress into a bull market, the farther the thoughts of the danger seem to recede from their consciousness. Until, that is, we have a volatile period like the one we have been going through since the January 26th peak in the stock market—then, the fears and anxiety surface. Do your clients’ investments qualify for the “just in case” risk management that applies to much of our everyday life? Let’s look at the three elements. 1. Is the risk real? Since just 2008, there have been 11 market corrections equal to or greater than 10% in the S&P 500. As long as these downturns merely remain corrections, a client’s investments are not really in serious danger. Like in the current correction, advisors and their clients still have time to act. As the following chart discloses, most of these have seen the uptrend quickly restored. Note: Corrections are declines of 10% or more, while minor ones are 5%-10% (all shaded blue). 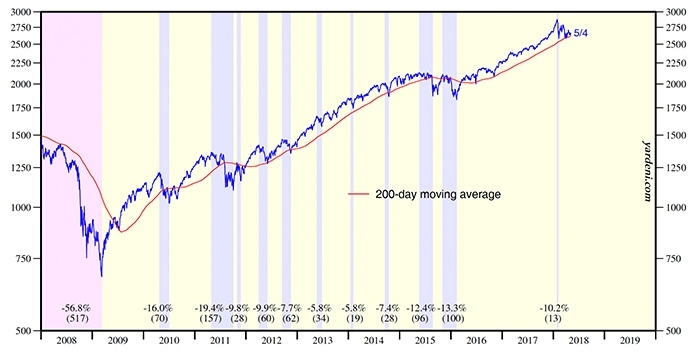 Bear markets are declines of 20% or more (shaded red). Number of calendar days in parentheses. Data from Standard & Poor’s. Data through 5/4/18. Still, since the beginning of 2000, there have been three S&P 500 Index bear markets (defined as a decline of about 20% or greater). During these mega downturns, the stock market does not stop falling in 10%–15% correction territory. While the 2011 bear market resulted in “just” a 19.4% loss, the other two resulted in more than a 50% loss of one’s investment. Imagine … a $100,000 nest egg becomes worth less than $50,000 in a matter of months. Worse still, each of these index declines took over seven years to return to breakeven. Since the top in 2007 was close to the top in 2000, it works out that there were actually around 14 years with no gains. What’s the rate of return on that investment? And all these facts and figures merely reflect investing in the S&P 500. Yet the same two bear markets saw an investment in the NASDAQ 100 Index, which contains all of the popular tech darlings, lose over 70%! Each investment dollar became worth less than 30 cents—not once, but twice in a decade. Conclusion: The danger is real. 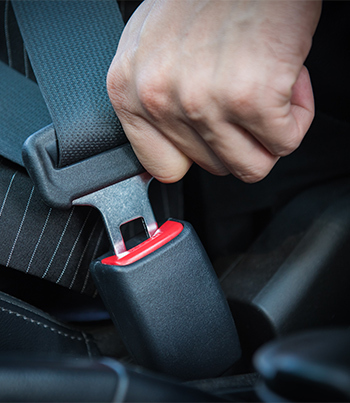 Decades ago Ralph Nader sparked a safety revolution in the auto industry with his best seller, “Unsafe at Any Speed.” To respond to the Nader challenge, the auto industry did not have just one silver-bullet response. Instead, scores of new safety devices and fundamental structural changes were added to the family car. This is not an exceptional response to a perceived danger. Throughout history, it has usually taken more than one type of risk management to mitigate danger. Why don’t investors seem to realize that there is no one-size-fits-all response to financial market risk? Incredible numbers of investors choose to simply track the domestic stock market with their portfolio, usually with passive index funds that are clones of the S&P 500 and NASDAQ 100 Indexes. These indexes contain lots of stocks, thus diversifying the risk of investing in a single company where the loss can be total. Yet, the first section of this article demonstrates the very real losses risked every day by investing solely in passive stock funds tracking these popular indexes. Just as they follow the indexes to the upside, they also track the indexes on the downside. Fortunately, most investors using financial advisors, and planners do diversify a second way: among asset classes. Yet, the last two major corrections have taught a hard lesson. When the broad market indexes decline here in the U.S., most of the worldwide asset classes used to diversify fall as much or more. History tells us that the only true asset-class diversifiers are bonds and gold. In a rising interest-rate environment, though, the former is overused in most portfolios, while the latter is underused. Worse still, as bull markets progress and grow long in the tooth, the allure of having a higher and higher percentage of the portfolio in stocks grows. People adjust their answers to suitability profiling questionnaires to take on more risk. They fail to rebalance, and the equity percentage automatically grows higher. They see the indexes soaring while their diversified portfolio trails, and they ask their advisors to assume more risk on their behalf. When the inevitable bear market occurs, they learn what risk really is. They suffer losses closely approaching the indexes they were trying to catch a few months prior. True “just in case” investors, through their advisors, employ more risk-management approaches than just two. Index investing and asset-class diversification are not enough. These risk avoiders employ dynamic risk-management strategies (which provide more effective diversifiers than just bonds and gold) and managed, strategic diversification (diversifying by actively managed strategies as well as asset classes). Their portfolios are filled with “plan B” investments that are not only actively managed, but they also can provide redundant risk-avoidance mechanisms. Like those who employ accountants, tax preparers, attorneys, craftspeople, and other specialists, investors and their advisors seeking added risk protection usually turn to experts in the field, such as third-party investment managers. These independent investment firms can employ a dynamic, risk-managed philosophy and style, and they can also create portfolios diversified not only by asset class but also by strategies. Using redundant investment methods and relying on experienced tacticians usually comes after an investor has repeatedly sustained market losses. Most investors with just a medium degree of experience over the last two decades have realized these losses. Most have learned that they have to do something different from the conventional “buy and hope” approach if they are to progress. (1) They realize that, like insurance, these protections have a cost. (2) They also understand that an investor can’t have one foot out of the risky asset door and do as well as a market index that is always fully invested. (3) They know that you can’t take suitability into account and always carry gold and bonds in your portfolio without trailing stocks when equities are rallying. (4) And finally, when the market “fakes out” even their cautious advisors when a correction doesn’t turn into a bear market, they realize that the small loss that was taken was done to be correctly positioned just in case the bear market had occurred this time. Finally, “just in case” risk avoidance requires investors to put their preventative tools in place before the loss occurs. Just as one cannot wait for the auto accident to occur before buying the auto insurance, investors can’t wait to add risk management until after the market loses 20% or more. Yet the fear of missing out on further gains delays many investors from accepting the costs of major risk avoidance. Regret also sets in in the early days of a correction. Investors think they have missed an opportunity to reduce their risk and then do what usually is the worse course of action: nothing. Correction or not, most investors have learned that risk is always with us in the financial markets. To combat its omnipresence, investors must realize that risk-management tools are not a “sometime thing” but instead must always be employed. Just in case a 10% correction turns into a bear market. Just in case a 20% downturn for index funds morphs into a 50% mega bear. Just in case the time to get back whole again extends to seven years … or 14. Are your clients, especially those near or in retirement, ready to embrace the long-term benefits of dynamic risk management for their portfolios … just in case?